Idi Amin Dada, who became known as the 'Butcher of Uganda' for his brutal, despotic rule whilst president of Uganda in the 1970s, is possibly the most notorious of all Africa's post-independence dictators. Amin seized power in a military coup in 1971 and ruled over Uganda for 8 years. Estimates for the number of his opponents who were either killed, tortured, or imprisoned vary from 100,000 to half a million. He was ousted in 1979 by Ugandan nationalists, after which he fled into exile. 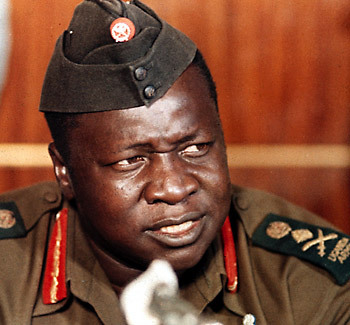 Idi Amin Dada was born in 1925 near Koboko, in the West Nile Province of what is now the Republic of Uganda. Deserted by his father at an early age, he was brought up by his mother, a herbalist and diviner. He was a member of the Kakwa ethnic group, a small Islamic tribe that was settled in the region. Idi Amin received little formal education: sources are unclear whether or not he attended the local missionary school. However, in 1946 he joined the King'S African Rifles, KAR (Britain's colonial African troops), and served in Burma, Somalia, Kenya (during the British suppression of the Mau Mau) and Uganda. Although he was considered a skilled, and somewhat overeager, soldier, Amin developed a reputation for cruelty - he was almost cashiered on several occasions for excessive brutality during interrogations. He rose through the ranks, reaching sergeant-major before finally being made an effendi, the highest rank possible for a Black African serving in the British army. Amin was also an accomplished sportsman, holding Uganda's light heavyweight boxing championship from 1951 to 1960. A Hint of What was to Come? As Uganda approached independence Idi Amin's close colleague Apolo Milton Obote, the leader of the Uganda People's Congress (UPC), was made chief minister, and then prime minister. Obote had Amin, one of only two high ranking Africans in the KAR, appointed as First Lieutenant of the Ugandan army. Sent north to quell cattle stealing, Amin perpetrated such atrocities that the British government demanded he be prosecuted. Instead Obote arranged for him to receive further military training in the UK. 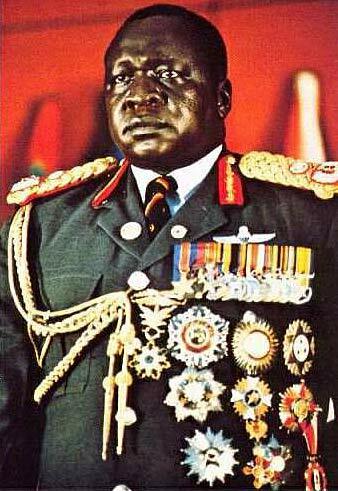 On his return to Uganda in 1964, Idi Amin was promoted to major and given the task of dealing with an army in mutiny. His success led to a further promotion to colonel. In 1965 Obote and Amin were implicated in a deal to smuggle gold, coffee, and ivory out of the Democratic Republic of the Congo - the subsequent funds should have been channeled to troops loyal to the murdered DRC prime minister Patrice Lumumba, but according to their leader, General Olenga, never arrived. A parliamentary investigation demanded by President Edward Mutebi Mutesa 11 (who was also the King of Buganda, known colloquially as 'King Freddie') put Obote on the defensive - he promoted Amin to general and made him Chief-of-Staff, had five ministers arrested, suspended the 1962 constitution, and declared himself president. King Freddie was finally forced into exile in Britain in 1966 when government forces, under the command of Idi Amin, stormed the royal palace. Idi Amin began to strengthen his position within the army, using the funds obtained from smuggling and from supplying arms to rebels in southern Sudan. He also developed ties with British and Israeli agents in the country. President Obote first responded by putting Amin under house arrest, and when this failed to work, Amin was sidelined to a non-executive position in the army. On 25 January 1971, whilst Obote attended a Commonwealth meeting in Singapore, Amin led a coup d'etat and took control of the country, declaring himself president. Popular history recalls Amin's declared title to be: "His Excellency President for Life, Field Marshal Al Hadji Doctor Idi Amin, VC, DSO, MC, Lord of All the Beasts of the Earth and Fishes of the Sea, and Conqueror of the British Empire in Africa in General and Uganda in Particular." Idi Amin was initially welcomed both within Uganda and by the international community. King Freddie had died in exile in 1969 and one of Amin's earliest acts was to have the body returned to Uganda for state burial. Political prisoners (many of whom were Amin followers) were freed and the Ugandan Secret Police was disbanded. However, at the same time Amin had 'killer squads' hunting down Obote's supporters. Amin retaliated against the attempted invasion by Ugandan exiles in 1972 by purging the army of Obote supporters, predominantly those from the Acholi and Lango ethnic groups. In July 1971, Lango and Acholi soldiers were massacred in the Jinja and Mbarara Barracks, and by early 1972, some 5,000 Acholi and Lango soldiers, and at least twice as many civilians, had disappeared.The victims soon came to include members of other ethnic groups, religious leaders, journalists, artists, senior bureaucrats, judges, lawyers, students and intellectuals, criminal suspects, and foreign nationals. In this atmosphere of violence, many other people were killed for criminal motives or simply at will by Amin, who often stuffed the Nile River with their bodies. The killings, motivated by ethnic, political, and financial factors, continued throughout Amin's eight-year reign.The exact number of people killed is unknown. The International Commission of Jurists estimated the death toll at no fewer than 80,000 and more likely around 300,000. An estimate compiled by exile organizations with the help of Amnesty International puts the number killed at 500,000. Among the most prominent people killed were Benedicto Kiwanuka, the former prime minister and chief justice; Janani Luwum, the Anglican archbishop; Joseph Mubiru, the former governor of the Central Bank; Frank Kalimuzo, the vice chancellor of Makerere University; Byron Kawadwa, a prominent playwright; and two of Amin's own cabinet ministers, Erinayo Wilson Oryema and Charles Oboth Ofumbi. In August 1972, Amin declared what he called an "economic war", a set of policies that included the expropriation of properties owned by Asians and Europeans. Uganda's 80,000 Asians were mostly from the Indian subcontinent and born in the country, their ancestors having come to Uganda when the country was still a British colony. Many owned businesses, including large-scale enterprises, which formed the backbone of the Ugandan economy. On 4 August 1972, Amin issued a decree ordering the expulsion of the 60,000 Asians who were not Ugandan citizens (most of them held British passports). This was later amended to include all 80,000 Asians, except for professionals, such as doctors, lawyers, and teachers. A plurality of the Asians with British passports, around 30,000, emigrated to the UK. Others went to Australia, Canada, India, Kenya, Pakistan, Sweden, Tanzania, and the U.S. Amin expropriated businesses and properties belonging to the Asians and handed them over to his supporters. The businesses were mismanaged, and industries collapsed from lack of maintenance. This proved disastrous for the already declining economy. On 20 July 2003, one of Amin's wives, Madina, reported that he was in a coma and near death at King Faisal Specialist Hospital in Jeddah, Saudi Arabia, from kidney failure. She pleaded with the Ugandan President, Yoweri Museveni, to allow him to return to Uganda for the remainder of his life. Museveni replied that Amin would have to "answer for his sins the moment he was brought back". Amin died at the hospital in Jeddah, Saudi Arabia, on 16 August 2003 and was buried in Ruwais Cemetery in Jeddah.